It's my annual "joke" post where I promise there will be good content this year and make one valiant effort and forget again. I've pulled A Feast for Odin back off the shelf and trying solo again. I've played 4 solo games in the last several days, and my scores are improving. I should write something colorful up to track these things on the blog, and I will start to. My current high score is 112. 100 is "very good" according to the rulebook, but there are those who claim that 140+ is not only attainable but consistently attainable. 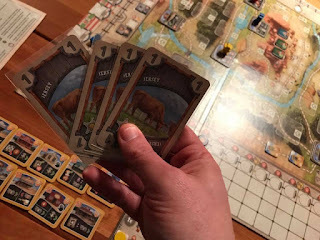 Great Western Trail was one of the "cult of the semi-new" games I picked up recently, and I really love it. It's a mid-heavy-weight game about traveling along the eponymous trail with your cattle and selling them, over and over. It's a euro where the theme could be anything, and some links are extremely tenuous, but fun and gives you a bunch of interesting decisions. Last night was only the third time I've played (other than a brief experimentation with a solo variant). I don't remember the scores of the first game, but I do know I won game 2 by a wide margin. Last night I was not so lucky. If you know the game, you will know that this is the worst possible hand of cows you can draw. When you reach Kansas City, your reward is based on having a variety of cows. Not only are these all the same, but they are the lowest value. Effectively, upon arrival in Kansas, this hand full of Jersey Cows would be worth $1, with the only possible place to "sell" them being Kansas City itself, which gives you -6VP. ... But it also gives you +$6. Remember that for a moment. Since my hand of cows was lousy, and I was a few steps in toward Kansas City, I decided to move slowly, through spaces that could (relatively inefficiently) cycle bad cows out of my hand. I lost so much momentum from moving slowly, and couldn't get an economy going so it became a self-fulfilling defeat. All in the name of trying to sell my cows to a further-up city for potential long-term gain. The end score was 81-80-56-49. Guess which one was me? Looking at a spread like this, -6 VP doesn't look so bad when it also gives you +$6 and a full hand-cycle that guarantees itself to be worth at least 1 more. If I had "galloped" to Kansas City quickly with my crap hand, I may have built up to some strong followup turns. I will remember this for next game. Which will hopefully be soon (whether in meatspace or on Tabletop Simulator). Will see what happens with a strategy of an early Kansas City rush. My goal this year is to focus on quantity of plays of games I've already got, more than looking at shiny new squirrels. I won't completely be blind to the Cult of the New, but I always feel sad when I play a new game with substance only once or twice before being able to formulate strategies and see a game for what it truly is (or be able to appreciate its expansions). I want to spend a lot of time on GWT and Terra Mystica, primarily, and we'll see what else pops up. I remember this blog exists. I truly do. A year ago, I said 2017 was going to be the year I actually started updating the blog, and also started thinking about my podcasting aspirations. Neither of these things happened. Let's see whether this blog gets any traction in 2018. I've been throwing around the idea of a podcast for awhile, and what better use for the flailing blog.tornsignpost.com than to try to resurrect its name with audio? I've just returned from Granite Game Summit, and I've (separately) been thinking a lot about Legacy games, so I definitely have a lot to talk about for at least a zeroeth episode. I'm having a little trouble setting up accounts on some sites; amongst them is instagram. A few weeks ago, I tried creating a "tornsignpost" userid, got an error, and now it's in some sort of state of flux. Different parts of instagram either think the userid has been disabled, doesn't exist, isn't associated with an email address, or already exists. Their support tool through the app doesn't even work -- it claims that I'm not entering a proper country name -- so I'm trying to email their support. So if I do start up the podcast, and give it an instagram account, there's a chance it won't match the naming convention. Hope to talk to you soon. GRR on! Keep watching this space though. Happy new year to my hundreds tens ones of readers! 2017 is going to be the year I consistently update my blog. I can feel it! The subject line here should give you an idea of what's in my queue to talk about soon. I'll separate them into different posts, especially since there are some spoilers you might want to avoid.